I have a vivid memory of the first dish my dad taught me how to cook: scrambled eggs. I was four, and I used a yellow step stool to reach the pan on the stove. I remember loving the eggs cooked until they were brown — they were a favourite food. I also loved pasta Alfredo. Creamy fettuccine was one of the few dishes I’d eat (I was pretty picky). There’s no doubt I was hooked on eggs and cream from an early age. Food can be so nostalgic. Flash forward thirty years and it’s my turn to introduce foods to my little girl. Armed with knowledge (thanks to a slew of nutrition books, articles, conversations etc), Darren and I are excited to raise our baby on a vegan diet for her health, for our planet’s health and for the animals. Luckily for her, she’ll (hopefully) never have to battle unhealthy addictions to high-saturated-fat, high-salt foods like cheese and bacon. I feel grateful to have learned so much about the benefits of a plant-based lifestyle—specifically how all the nutrients required for a healthy diet can come from plants. I owe so much of my health and energy to a vegan diet and I’m excited to share this lifestyle with my daughter. Is it stressful being the parent of a vegan baby? Nope. In fact, I think I’d be more stressed if I had meat in the house. Before we switched Effie to plant-based dog food, she ate raw meat and I was constantly worried about cross-contamination of the dangerous bacteria. As far as making sure Roen gets all the necessary nutrients, I simply focus on feeding her a wide variety of colourful foods. I’m not obsessing over nutrients, but I do pay extra attention to iron and calcium. Turns out, the daily recommended intake of iron and 60 percent of the daily recommended intake of calcium can be attained with less than a third of a cup of iron-fortified hot cereal. There are many other foods that contain these two minerals (which I elaborate on below). We were so excited for Baby R to start eating that we probably jumped the gun a bit. At five-and-a-half months, she really seemed to be eyeing my avocado toast, so I thought we’d get her started on solids. The first food we tried was mashed avocado and her reaction was a series of eyes-rolling-in-the-back-of-her-head gag reflexes. If you don’t believe me, check out the video D took. She was not a fan! …at first. Now, at 13 months, she devours about half an avocado a day. Week two feeding not as successful as week one. The first food she actually ate (and kept down) was an iron-fortified buckwheat chia baby cereal. Below is D’s video of her getting excited for breakfast! She gradually warmed up to other foods, like coconut or soy yogurt and fruit/veg purees. 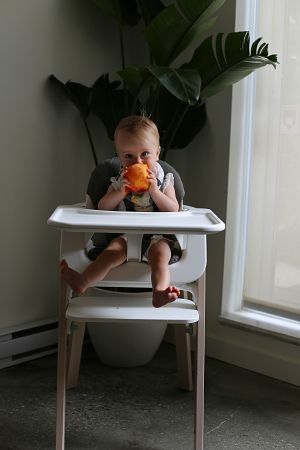 I love the concept of baby-led weaning but was too terrified of choking to give her hard foods like apple and raw vegetables, despite understanding that babies have strong gag reflexes and the chances of them choking are slim. I just couldn’t do it! …so have stuck to mainly soft foods. Roen also still drinks breastmilk (about 24-30oz a day). 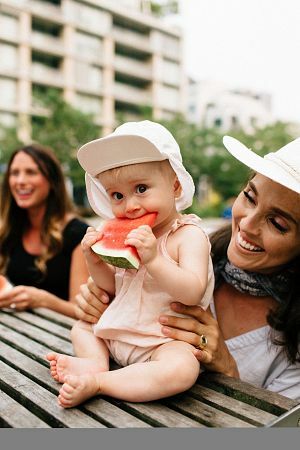 Here are a few of our vegan baby’s other favourite foods. We love Love Child Organics’ iron-fortified oat and chia cereal. Sometimes, if Roen is being picky, I mix in a bit of dairy-free yogurt (her favourite is Silk Coconut Yogurt) and she’ll eat it. Definitely her favourite thing to eat. She pumps her arms and makes excited noises when I pull the tub out of the fridge. I sprinkle it with hemp hearts for extra iron, protein, and healthy fats (especially important for growing little ones!). Cut into cubes. Easily one of my favourite foods to give Roen because it’s impossible to choke on avocado, right?! Plus, it’s a great way to pack in some calories. Cut it in half, then cut out the soft little one-bite segments. Perfect for babies who don’t have any teeth yet (like Roen!). Also a great source of vitamin C, which increases iron absorption. Raspberries and blackberries are her fav. They’re a bit of a splurge at this time of year, but she absolutely loves them and they’re so full of nutrients! You can also find them in the frozen section year-round. We share! Our go-to is frozen banana, spinach, almond milk, ginger, dates, ground flax, cinnamon, ice. One of her favourite breads is Silver Hills because it’s sprouted and very thin (easy to eat!). Roen isn’t a huge fan of nut and seed butters yet so I don’t put lots on but her taste buds will get there! To entice her I sometimes add a bit of maple syrup. Stir together 1/4 cup chia seeds with 1 cup plant milk and let sit in the fridge for a couple of hours – voila, pudding! Sweeten with maple syrup if you wish and definitely add a 1/2 tsp of cinnamon for its antioxidant benefits. In summer, a big ripe juicy peach is Roen’s absolute favourite! The only downside is, they are so juicy, she gets covered head to toe in peach juice! A post-peach bath is required one hundred percent of the time. We love the Love Child and Plum organic puree pouches when we’re traveling or on the go. I think at least half the options on shelves are vegan and many of them contain quinoa for extra protein. When in doubt (that your baby is getting enough protein, iron and other nutrients)…hemp hearts! Sprinkle them on anything and everything! They are pretty much flavourless and nearly undetectable sprinkled onto most foods. Roen’s dinner consists of a few of the below ideas, but let’s be honest, there are always leftovers from breakfast and lunch, so she eats those for dinner, too. We mix it up between whole grain pastas (quinoa, kamut, whole wheat) and protein-packed chickpea or lentil pasta or vermicelli. Spirals (fusilli) are our favourite because of how well they hold sauce. Roen loves her pasta with either a bit of tomato sauce or fresh-squeezed lemon juice and vegan butter. A huge fav. Just steam your cauli, then mash it up with a fork or blend it up in your blender/small hand-held device. If blending it completely I usually add a splash of almond milk. Optional: add a sprinkle of hemp hearts. Whenever she seems bored with regular cauliflower we drizzle on a little lemon juice. Cut them up into rounds and place on a parchment-lined baking sheet. Sprinkle with antioxidant-rich oregano and bake at 400F until soft (about 25 minutes). Slice up medium-firm tofu into cubes or sticks and coat with sauce (our go-tos are pasta sauce or tahini-water-lemon-juice sauce). Big soft beans, such as navy beans, are super baby friendly! And apparently beans in a can are just as nutritious as beans you boil at home. I serve them plain or maybe with a bit of tomato sauce or lemon juice. See above Green Smoothie recipe. Such a great source of protein and iron. Roen will eat hummus on toast and on roast veggies, but her favourite way to eat it is off a cracker…which is merely a vessel! She doesn’t eat the cracker. A new favourite of Roen’s. She’s been loving warm quinoa mixed with a bit of coconut milk (to add moisture, flavour, and healthy fats). Spread with a little vegan butter, sprouted bread is a healthy source of digestible nutrients—plus, one slice has 6 grams of protein! You could sprinkle a slice with hemp hearts or mash on some avocado. Fruit is always on the menu for dessert. Berries are Roen’s favourite, and good thing, because they are so incredibly nutrient-dense. She also likes grapefruit, banana, kiwi, pear, canteloupe. Another article I highly recommend you read is “On Raising Children Vegan,” by Anna Pippus. Anna is an enthusiastic mom of two boys, aged two and four, who have both been vegan since conception. She is my greatest resource when it comes to anything vegan and baby-related. Three of the most common questions I’m asked as a vegan / mother of a vegan baby are “how do you get your protein, iron and calcium.” At one point, I was the person asking these questions, but after diving into this plant-based world I learned that it’s actually really hard to not get enough protein in a day as long as you’re consuming your recommended daily intake of calories (aka a normal amount of food) from whole, unrefined sources. As for vitamin B12, babies get it through their mothers’ milk. I take a daily B12 vitamin to make sure I’m getting lots for Roen. If your baby doesn’t drink breast milk, there are baby multivitamins which can easily fill this gap. Most plant-based milks are also fortified with B12. Here’s a list of foods that tick off the ‘protein, iron and calcium’ boxes along with some more quick ideas on how you might incorporate these into your baby’s diet. If breastmilk wasn’t an option, Roen would be drinking soy formula. Cow milk, with its insulin-like growth factor (IGF-1) and high level of hormones (due to the multiple pregnancies dairy cows endure), wouldn’t be up for consideration as its designed perfectly by nature to grow a 65-pound calf into a 700-pound cow. My friend Anna (a mother of two boys, both vegan since conception) elaborates on this topic and she puts it better than I could in her post here. BASICS: Soy contains isoflavones, a type of phytoestrogen that is 1000 times weaker than human estrogen and does not behave exactly like human estrogens in our bodies. Isoflavones block some of estrogen’s effects and mimic others, generally resulting in health benefits. They also have antioxidant and anti-inflammatory properties. Soy has the highest protein and fat content of any legume and is high in iron and fiber. WOMEN’s HEALTH: Soy has been shown to prevent breast cancer in the amounts consumed in Asia. A 2008 review showed that women averaging one cup of soy milk/ 1/2 cup of tofu per day had a 30% lower risk of developing breast cancer versus women who avoid soy. Soy has also been shown in many studies to reduce the risk of recurrence in breast cancer survivors. A recent study showed that breast cancer survivors who consumed the most soy had a 21% lower risk of dying of any cause over the 9 year study, compared with low-soy consumers. Soy reduces the risk of endometrial cancer and can reduce menopausal hot flashes. MEN’S HEALTH: A large 2010 systematic review showed that soy does not affect testosterone levels, sperm concentration, or sperm quality. Soy may lower the risk of prostate cancer by up to 50%. THYROID: Soy does not affect the thyroid in people with normal thyroid function and iodine levels. Whether or not you eat soy, you should meet your daily iodine needs (150mcg/day). If you take thyroid hormone, you may need the dose adjusted if you change your soy intake. CARDIOVASCULAR RISK: Soy lowers blood pressure and LDL cholesterol. REALITY CHECK: Some worry about estrogen and GMOs/pesticides from soy, but most dietary estrogen comes from dairy and meat products. Unlike soy phytoestrogens, animal estrogens DO mimic human estrogen in our bodies. Similarly, most GMO soy is used to feed chickens, pigs, and cattle, which are then consumed by people. Much of the soy grown for human consumption is non-GMO.